Dolphinfish are excellent eating table fish. Grilled, blackened, or baked are the most common ways to prepare Mahi fish. Dolphin is low in saturated fat and is a good source of vitamin B12, phosphorus, and potassium and a very good source of protein, niacin, vitamin B6, and selenium. 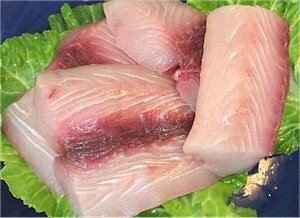 Mahi Mahi offers a tender but firm flesh with a large moist flake and a sweet yet slightly strong flavour. The meat is smooth and firm with a pink to creamy white appearance. Typically, there is a small bloodline along the center of the fillet that is a slightly darker tint than the meat. Well-wrapped Mahi Mahi can be frozen up to two months in a refrigerator freezer, and three to four months in a deep-freeze.